Outside, owners enjoy premium pain in a variety of colors that speak to your individual style. The luxurious Mazda CX-3 interior features suede trim and leather trimmed sports seats. If you're a music fan, you'll appreciate the noise dampening solutions that result in acoustical excellence during every ride. 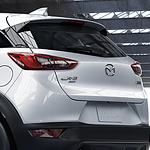 Instead of just taking our word for it, head over to Ramsey Mazda in Urbandale to learn about all of the outstanding features that the Mazda CX-3 has to offer. Taking a test drive is the best way to experience everything this SUV has to offer.